Bio Bidet Water Purify Carbon Filter is an optional accessory. Increase the lifespan of your electronic bidet with the in-line carbon activated water filter to protect your bidet against sediment and mineral buildup from water. Each filter lasts 6-9 months. This includes 3 pieces of carbon filter per pack. Bio Bidet Water Purify Iodine Filter is an optional accessory. Increase the lifespan of your electronic bidet with the in-line iodine water filter to protect your bidet against sediment and mineral buildup from water while releasing trace amounts of iodine to sterilize the water. Each filter lasts 6-9 months. Bio Bidet deodorizer filter eliminates up to 90% of embracing odors. Bio Bidet Water Purify Iodine Filter is an optional accessory. Increase the lifespan of your electronic bidet with the in-line iodine water filter to protect your bidet against sediment and mineral buildup from water while releasing trace amounts of iodine to sterilize the water. Each filter lasts 6-9 months. This includes 3 pieces of Bio Bidet Iodine Filter per pack. Quality inline ceramic core seals for the best seal and long life. Installs between the hose and hand bidet for complete easy to regulate flow of water. Chrome plated Brass hand bidet holder with build in on/off safety valve. When the hand bidet is placed in its holder, a actuator valve turns off the water source at the holder assembly thereby eliminating constant water pressure in the bidet hose when not in use. Sanicare Chrome metal hand bidet holder/mounting bracket complete with mounting screws. Sanicare Hand Held Bidet Holder -Model HBH03 - Chrome hand bidet holder/mounting bracket complete with mounting screws. Sanicare Universal hand bidet holder/mounting bracket complete with mounting screws. 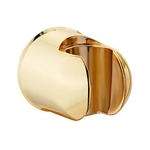 Available in Chrome ABS Plastic, Chrome Metal and Gold Finish ABS Plastic. Sanicare Universal hand bidet holder/mounting bracket complete with mounting screws. Bronze metal. Sanicare Universal Hand Bidet Holder- Chrome (ABS Plastic) - Model HBH08 complete with mounting screws. Sanicare Angle Valve Holder (Chrome Metal) - Model HBH09. Chrome angle valve with bidet holder. Quality chrome plated brass with adjustable volume control. 1/2" connections. 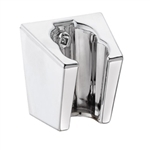 Sanicare Hand Bidet Holder (Chrome Plastic) - Model HBH11. Quality chrome plastic. This holder can be used on the wall by removing the tank clip or can be used as a toilet tank hand bidet holder. Sanicare Hand Bidet Holder (Stainless Steel) - Model HBH01ST. Quality stainless steel hand bidet holder. 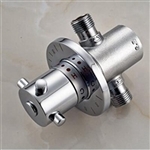 Highest quality chrome plated brass T adapter and ceramic on/off volume control. Designed for US toilets with 7/8" connection. Screen filter included. The RV adapter will allow you to install any of the Sanicare Deluxe series and Italia Luxury series hand held bidets to your RV’s existing toilet. If your Toilet already has installed a “water saver”, this is a great upgrade for a much more stylish and durable sprayer. Sanicare universal vacuum breaker. Meets all applicable codes in US and Canada. 1/2" connnection. Available in chrome, stainless, bronze. Ceramic Valve Hand Bidet Accessory (Chrome/Metal). The very best valves incorporate ceramic core seals for the best seal and long life. It's important that you have a separate valve on your hand bidet SEPARATE from the fresh water source to the toilet.